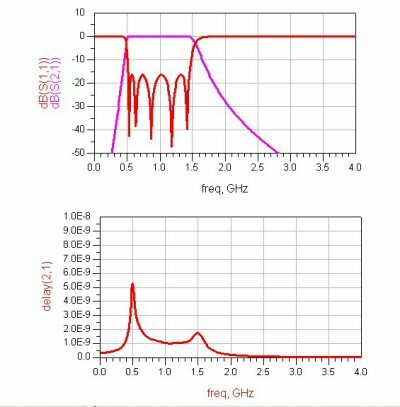 Group delay does funny things in microwave filters, especially near the edges of the pass band. There are ways to design a filter with flat group delay. A Bessel-Thomson filter provides the best (flattest) group delay responses of all the filter types. 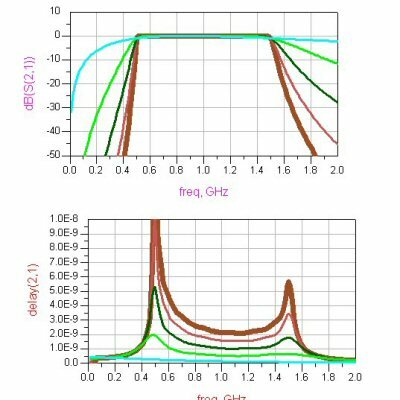 The group delay in a tiny edge-coupled filter can be the longest delay in a microwave receiver. In super-heterodyne receivers, the image noise rejection filter often produces the most variation in group delay from unit-to-unit, and across frequency. Note the the group delay response outside of the passband, if you can even measure it, is of no particular consequence in most cases. Below we have plotted the group delay responses of various filters. The first one is a Chebyshev bandpass filter, of order N=5, and 100% bandwidth. Recall that the Chebyshev response gives equal ripple in the passband (the top plot), and steep skirts. Guess what? Its group delay response (bottom plot) isn't very flat in the passband. Go here if you want to play with our lumped-element Chebyshev filter calculator! Next let's look at a Butterworth bandpass filter, of the same order (N=5) and bandwidth (100%). Remember, the Butterworth is deigned for the flattest possible passband (top plot). Oops, its group delay response (bottom plot) isn't very good either! The group delay of a filter is a function of many things besides the type of filter. Group delay increases as the order of a filter is increased. 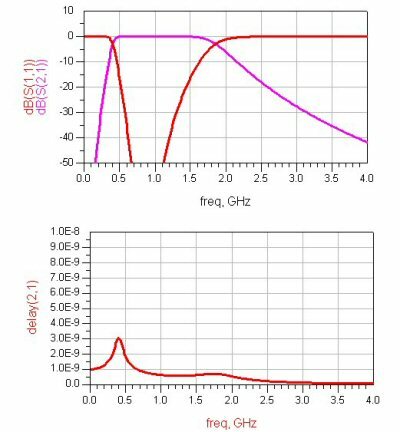 Below is a Chebyshev filter where the bandwidth is 0.5 to 1.5 GHz, with order N=1, N=3, N=5, N=7 and N=9. 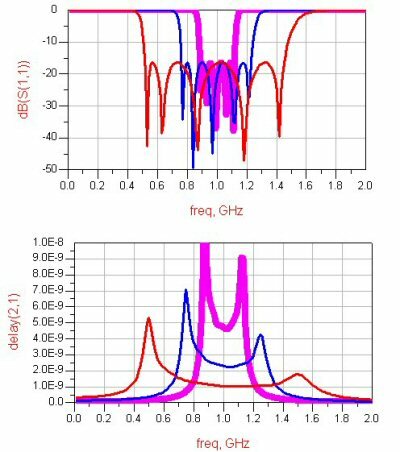 The upper plots shows the frequency response of S21, while the lower plot shows the group delay. Below is a plot of multiple filters of different bandwidth. You can see in the second plot that the group delay is getting longer as the bandwidth decreases. Filter group delay rule of thumb: The group delay of a filter is nearly proportional to its order. Also, filter group delay is inversely proportional to filter bandwidth (small percentage bandwidth filters have large group delay).